Apple and Google may have jumped on the bandwagon of smartwatches most recently, but Eric Migicovsky can be noted to have started the trend. In 2008, Migicovsky rolled out his first prototype for a smartwatch. 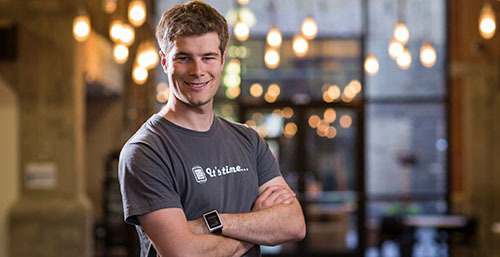 Migicovsky’s company Pebble sold thousands of smartwatches to their first customers via Kickstarter. After eight years of providing their customers with luxurious arm-wear that could connect them to the world or even keep track of their activities, Pebble was acquired for $23 million by Fitbit. “They’re not for everyone. For a couple of large groups of people, they are extremely useful,” Migicovsky said about who needs a smartwatch. “People who love to be connected, and want to keep up with the latest thing. They use smartwatches as their sixth sense,” he said. The watches connect to IOS and Android smartphones. If you are the type of person that doesn’t want to take out your phone to check messages or check other notifications, then you may be the right customer. Migicovsky went a different route when it came to raising money. Coming out of Y Combinator he thought they would easily raise $1 million. After receiving over 40 nos, he decided to use Kickstarter. That was one of the best decisions resulting in $10 million in his first round, and $20 million in a second round. Migicovsky also had the help of a senior editor at Engadget who released an article at the same time of the initial launch. Migicovsky had only hoped for about $5k from the first day of being on Kickstarter, but within hours they had raised over half a million dollars. Once Apple launched a smartwatch, the question of survival came up often. Migicovsky was sure Pebble supporters wouldn’t go anywhere. “We made a good product. It’s useful, functional, affordable, cool, and creative,” he said. “If you build something that people truly want and use, I believe there is long term value in that,” he continued. Pebble definitely had a community as well as a great price compared to the competition. To get you a luxury Pebble watch, it would only cost you between $99-250. Apple can start around $269 and go as high as $1500 for special editions. If you still aren’t convinced that a smartwatch is for you, there are a few reasons you should get one. “People who want to disconnect. They use smartwatches to keep in touch with one or two people they care about,” Migicovsky said. “The second group of people are health and fitness conscious folks,” he added. Finding the right one for you depends on your needs. “It’s all about the software,” the entrepreneur said. That would be the reason Fitbit purchased the software and operating systems of the company. You can still get a customizable watch that keeps you informed. In addition, you can still grab you a smartwatch at an affordable price with the same luxury. Check out some of the newest styles since the merge at www.fitbit.com.